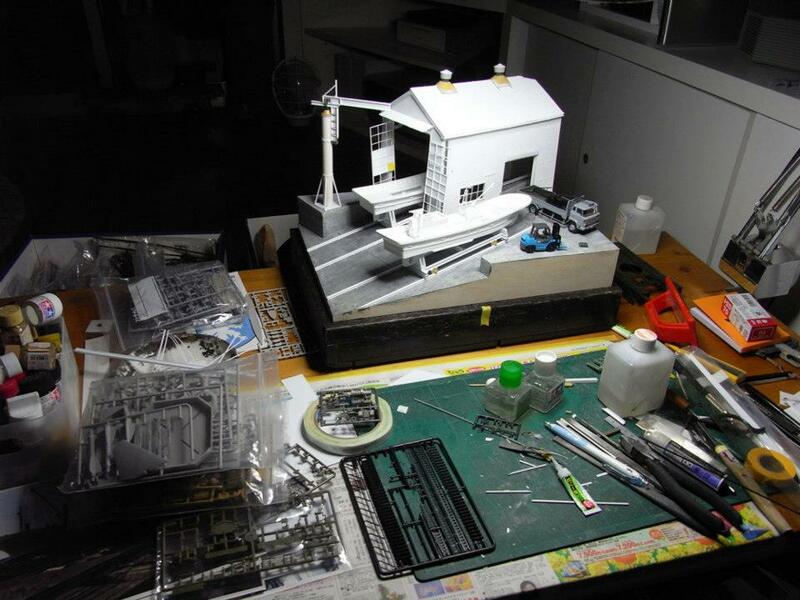 Remember carefully assembling models? Breaking off the little parts and painstakingly painting and gluing them together? There’s an art to doing it well. 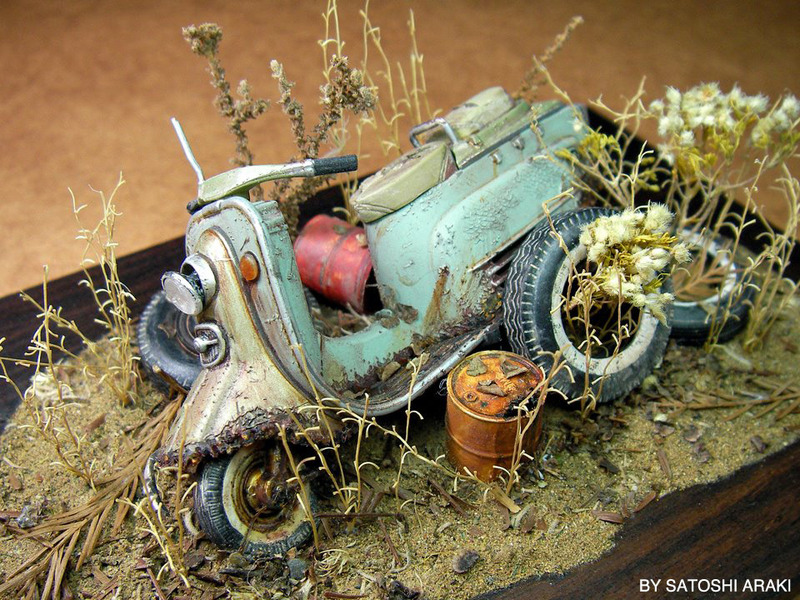 Then, there are guys like Satoshi Araki who take it much further, adding decay and the tiniest of details to his dioramas. 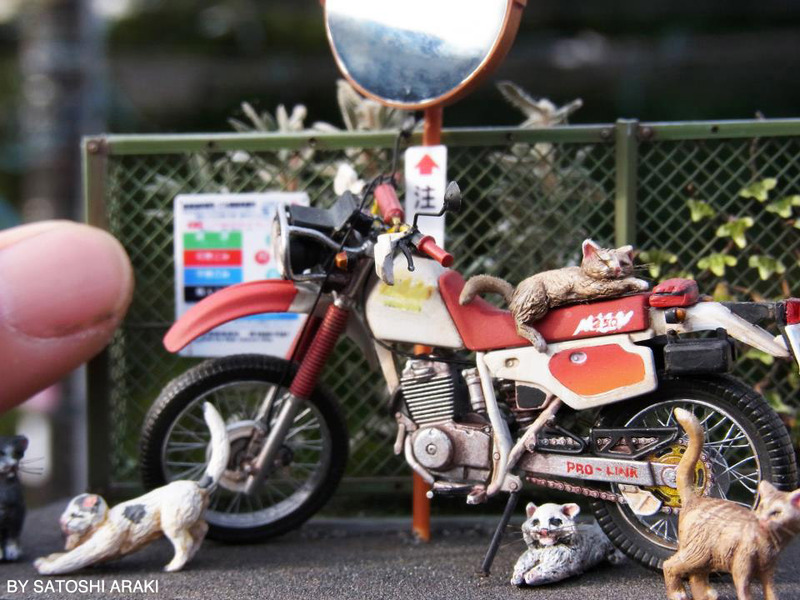 Tons of Satoshi’s incredible artwork can be seen on his Facebook page, but here are some motorcycle-related samples that we were drawn to and appreciate. 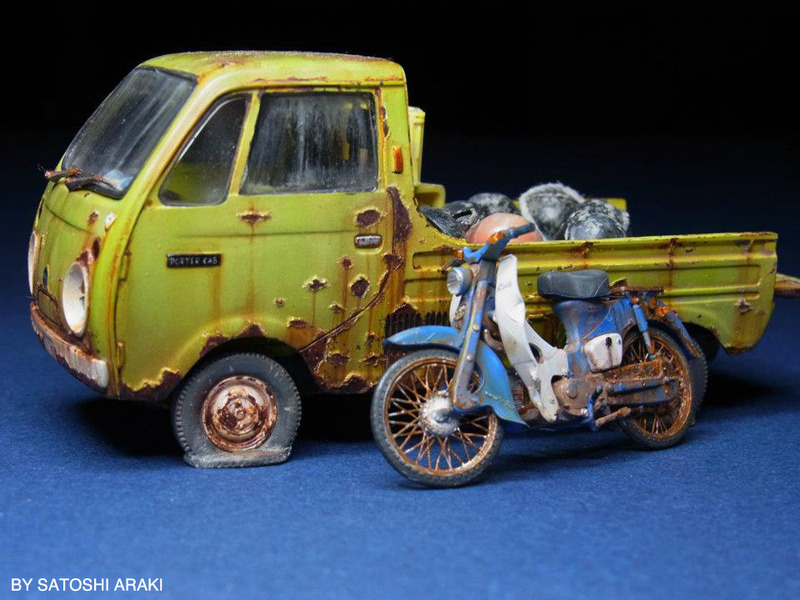 This li’l Honda Cub is 1/35 scale, leaning up against a 1/32 scale Mazda Porter Cab (a circa 1970 vehicle). 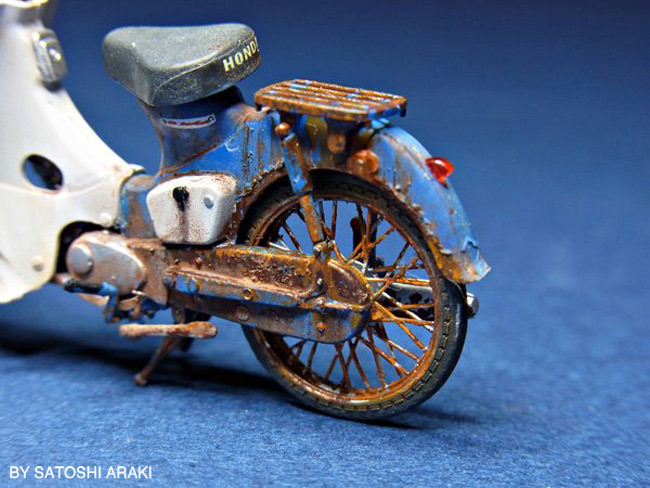 Using knives and blades to create the peeling paint and rust, Satoshi even achieves ‘scale’ to the models’ aged imperfections. Above: This scene features a discarded 1/24 scale Rabbit Superflow (circa 1964). The faux weeds and oxidation supplement the forgotten theme as the front fender wastes away. This image (above) gives you an idea of how Satoshi’s models go from a cleanly assembled piece to a worn result. 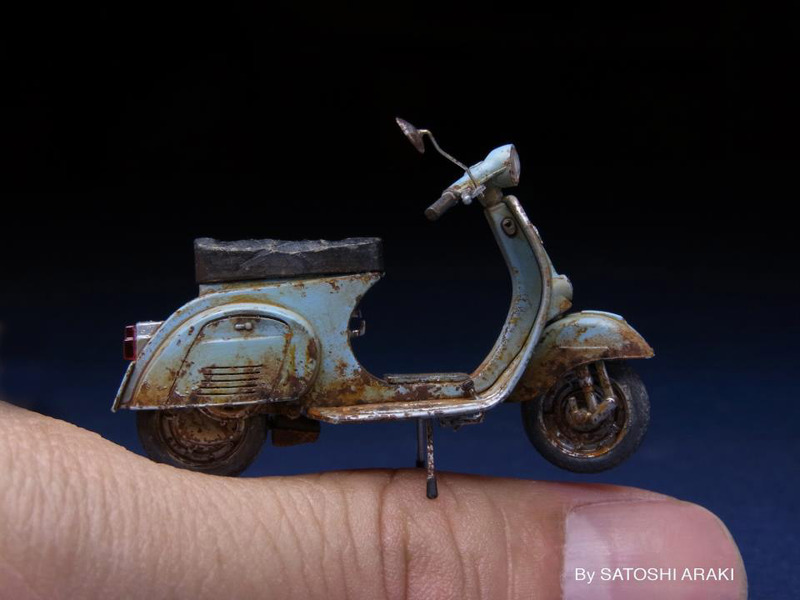 The 1/24 scale Vespa 125 becomes a tiny tattered character for one of his dioramas. 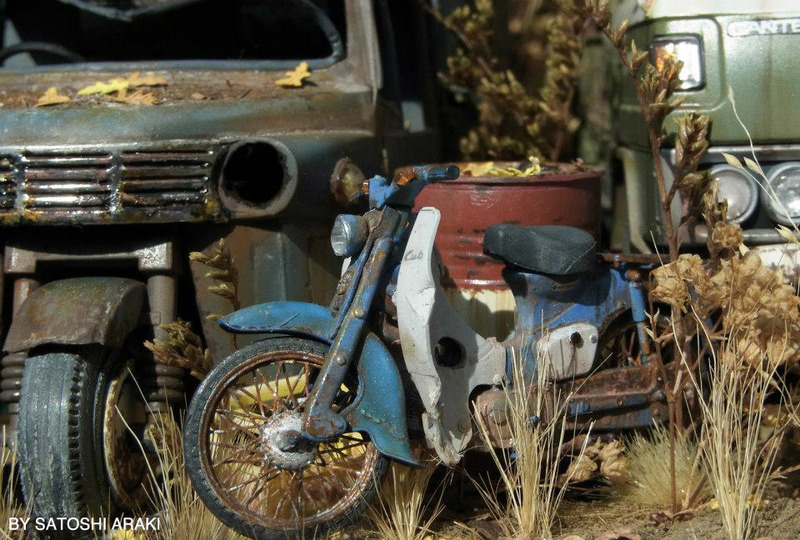 Another example of before and after, this 1/35 scale Simca 5 automobile goes from a neat little miniature to a junkyard relic. 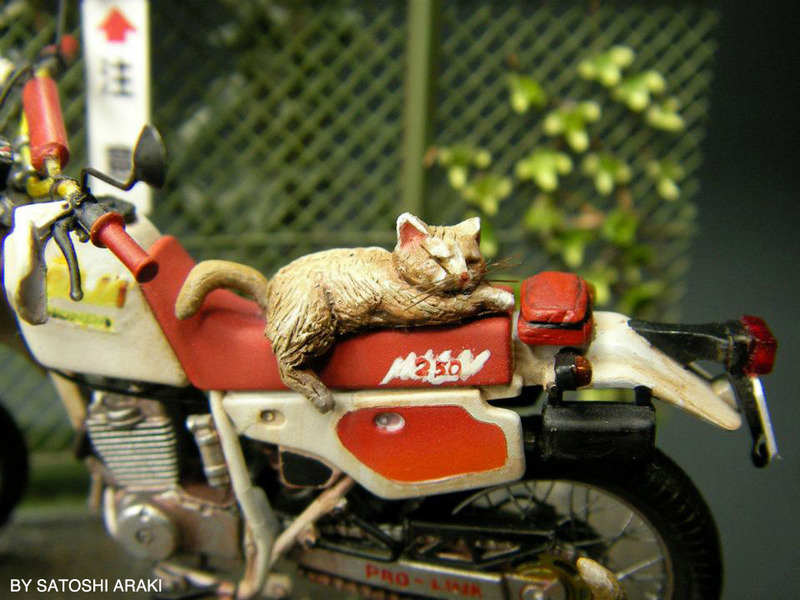 Satoshi says he loves cats and off-road motorcycles, which explains this particular feline/dualsport scene. 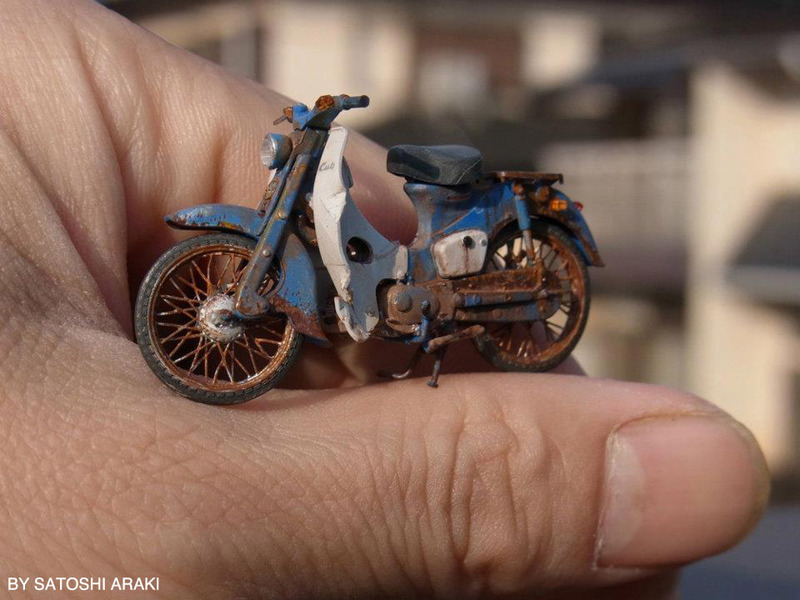 It’d be a treat to visit Satoshi’s studio in Tokyo and peer into his realm of miniatures. In the meantime, we’ll just stare at photos like these (above) to imagine the wonderfully tedious, artistic processes he goes through to achieve his work’s grubby awesomeness. 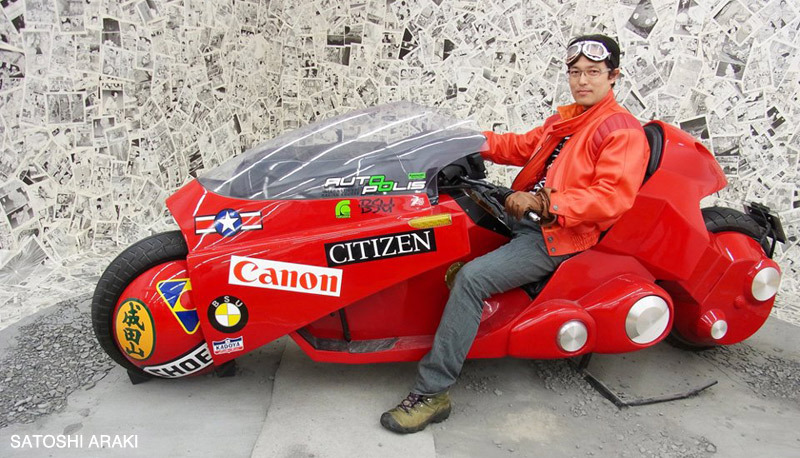 Here’s a shot pulled from Satoshi Araki’s Facebook page, showing him sitting on a replica of the Kaneda Bike from AKIRA. Sweet! Excellent !! so beatiful . 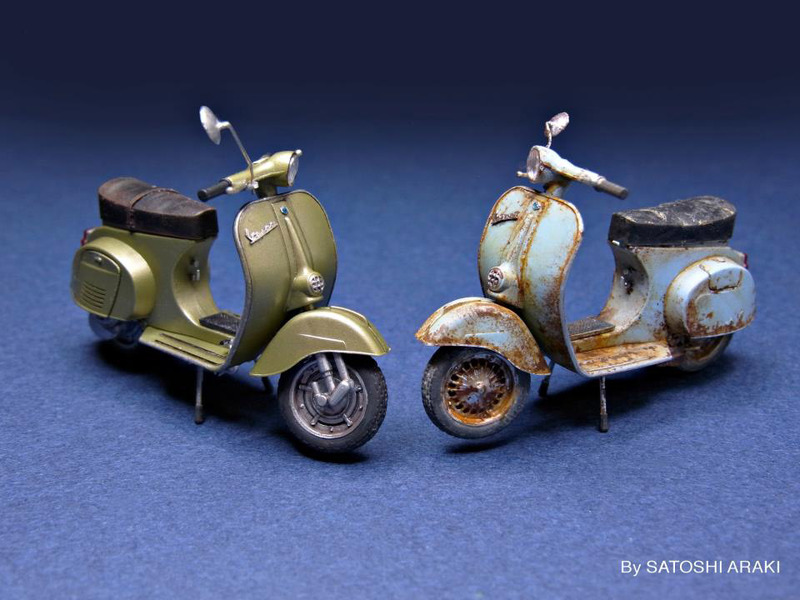 I was in search of miniature scooters online and came across your site. Just wonderful! 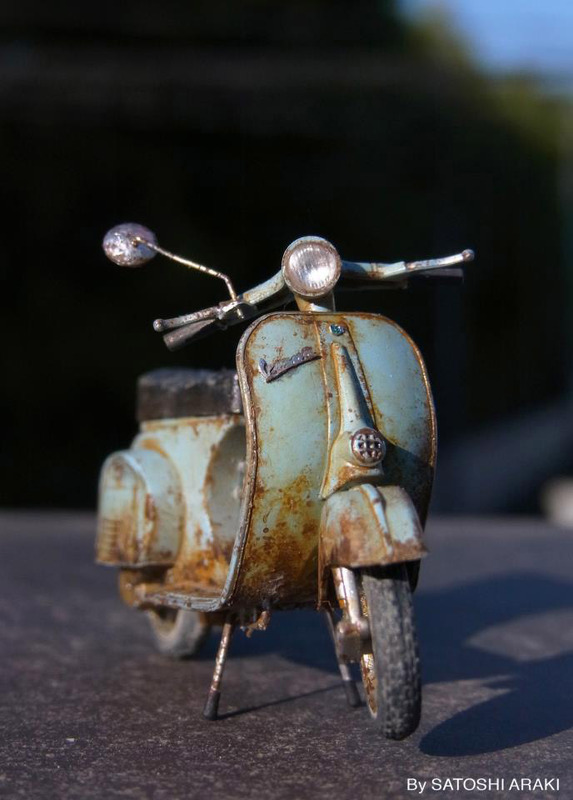 I am the editor for Dollhouse Miniatures Magazine and was wondering if you would like to feature your miniature scooters in an upcoming issue. I would love to share your work with our readers if you would be interested. It’s a great way to reach many people who have a passion for miniatures. You can email me at auralea@ashdown.co.uk if you are interested.